Much has been said after the presidential election in November 2012 regarding the Obama campaign’s use of 2010 U.S. Census data in targeting their efforts in various “swing” states. Multiple polls conducted over many months leading up to the election indicated that certain groups of voters–namely Latinos, African-Americans, Asians, and persons under age 35–were likely to vote 60 to 70 percent in favor of the President versus his opponent, Mr. Romney. The Obama campaign used Census and demographic data to figure out where those groups live, and targeted their efforts to areas with a relatively high density of such groups. This enabled them to funnel campaign resources and personnel into areas where they were most likely to achieve a favorable outcome. Sounds like good market research and fact-based business strategy to me, political leanings aside, and yet another example of using location analytics to effectively use information. Anything that can introduce more fact-based decision making into government and politics gets a “yes” vote from most Americans. The following discussion is literally an illustration of those facts. The digital maps and U.S. Census data for this analysis were obtained free of charge, and in a matter of minutes, from the U.S. Census Bureau at www.census.gov. They were downloaded and imported into GIS software and the maps presented herein were created within about two hours. The point to be made is that valuable information is readily available for use in many applications, especially geographic/demographic oriented market research and location analytics. The fact-based knowledge that falls out of such research and analysis enables organizations to make good decisions. That includes businesses, non-profits, charities, and political campaigns alike. It doesn’t cost a lot of money to utilize, but the cost of overlooking or ignoring it can be huge, as in the case of a multi-billion dollar presidential election campaign. Get Visual Business Solutions is an expert at finding and using this information to assist in sound decision-making. By the way, the New York Times has posted a fascinating map series of the presidential campaign results on their website at elections.nytimes.com/results/president. Be sure to check out the results by county, which is a useful accompaniment to the following discussion of demographic data by county. Given my fascination with geographic/demographic market research, I couldn’t resist digging into this subject and illustrating some data with maps–actually demonstrating location analytics– to enable visualization of demographics on the ground. It’s quite clear from considering the electoral votes up for grabs in the so-called “swing states” that the region of the U.S. commonly known as the industrial Midwest, or industrial Heartland, decided the election. Three of these states–Ohio, Wisconsin, and Iowa, with 34 total electoral votes–were estimated to be very tight races in the weeks leading up to the election, and in fact are where the election was won. I’ve lived in and traveled this area for most of my life, know it very well, and thus defined a collection of counties in nine states somewhat loosely as “the industrial Midwest.” The area, shown on Map 1, stretches from Des Moines IA and St. Louis MO on the west, to Buffalo NY and Pittsburgh PA on the east, from Green Bay WI on the north to the Ohio River on the south. It contains numerous large urban areas and 53 million people–one-sixth (17%) of the U.S. population. Getting back to my main discussion, Map 2 illustrates the population distribution of 15 to 34 year-olds in this “industrial midwest” area by county. While it’s possible to obtain 18 to 34-year-old population, the former age group was readily available and is a reasonable proxy for the more exact age range, which can be called “young voters.” This group is most important because it is the largest overall segment of “Democrat-favorable” voting population, includes all ethnic/racial subgroups, and comprises roughly 35 to 40 percent of the total population in the industrial midwest. As indicated by Map 2, there are numerous counties in the region with over 100,000 young voters, and these are concentrated around the major cities, especially Chicago, in the Big Ten university towns, and in the urban areas of Ohio and Wisconsin (key swing states). The total population of young voters in counties having over 100,000 of them totals 12.5 million, or about 60 percent of all young voters in the region. Map 3 shows that some of the counties outside of the big cities in the region have a significant proportion of young voters–most notably in the smaller college towns like Athens OH and Iowa City IA. This is significant because it assists in identifying possible campaign target areas beyond the more obvious large urban areas. By now, it is evident that the big cities and college towns in this region have large concentrations of young voters. Other demographic segments considered favorable voter prospects for the Obama campaign include Latino, African-American, and Asian populations. Since we know that the largest populations of all voters are concentrated around large urban areas, and those urban counties are fairly obvious targets, it would be more useful to look at proportion of total population for the remainder of this analysis, as was done on Map 3. This could serve to highlight some additional counties, perhaps beyond the big cities, that could also be targeted for campaigning to connect with higher percentages of Latino, Black or Asian populations in such areas. Since Iowa, Ohio, and Wisconsin, and to a limited extent, Indiana, are considered key swing states, I’ll focus most of the discussion around them. Also, I provide a rather loose description of ethnic and racial groups, and refrain from discussing detailed definitions and overlaps–to keep the discussion as brief as possible. Please refer to the U.S. Census documentation for such detailed descriptions of ethnic and racial groups. Starting with Latinos, as shown on Map 4, it’s evident that this segment of the population comprises 5 to 10 percent of the population in many counties, with some counties beyond the urban areas having 10 to 15 percent or even higher proportions. 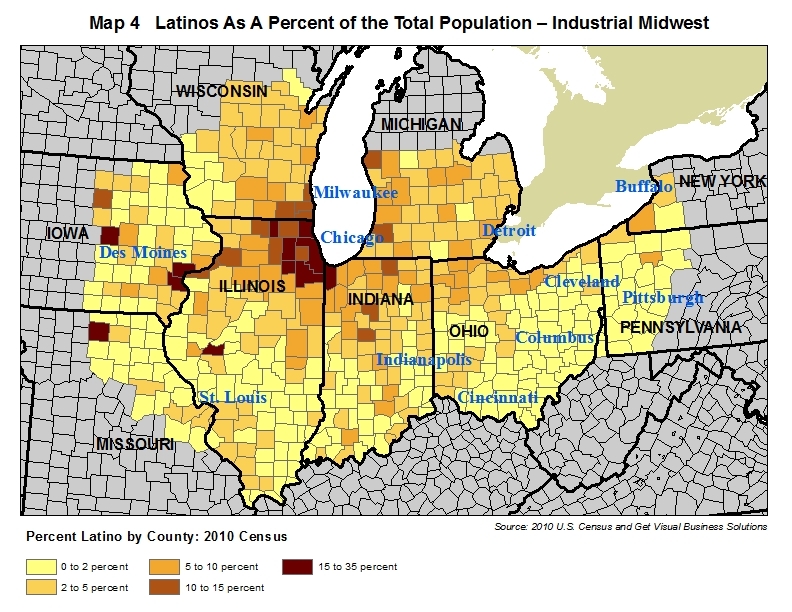 It also appears that the area within a radius of roughly 150 miles from Chicago–especially southern Wisconsin, northern Indiana, and the Illinois/Iowa border along the Mississippi River–have a significant share of Latino population, and these are not all urban counties. Some counties further west in Iowa (key swing state) also have high proportions of Latino population. The African-American population, as a proportion of total county population, is shown on Map 5. It is evident that this population is highly concentrated in the urban areas of the Industrial Midwest. This is particularly evident in Indiana, Ohio, and Wisconsin–in and around the Cities of Cincinnati, Columbus, Cleveland, Dayton, Indianapolis, Gary, Milwaukee, and Toledo. However, it appears that many other counties have a possibly significant proportion of African-Americans ranging from 5 to 15 percent of the population. Numerous counties in the industrial Midwest region also exhibit concentrations of Asian populations, as indicated on Map 6. Although these are not as large–as a percent of the total population–as young voters, Latinos, and African-Americans, they generally occur within the same counties and urban areas as concentrations of those other groups. Some exceptions to this exist in Wisconsin and Iowa. Asian populations do not appear nearly as significant in the industrial midwest as they are on the west coast, particularly California. Nevertheless, they do indeed add votes to the “Democrat-favorable” Latino and Black populations in the same counties. The main purpose of showing maps with demographic data is to illustrate information to provide a depth of insight and understanding simply not achievable with tabular summaries or the usual pie, bar, and line graphs. This is particularly true for those among us who think visually, geographically, and graphically. 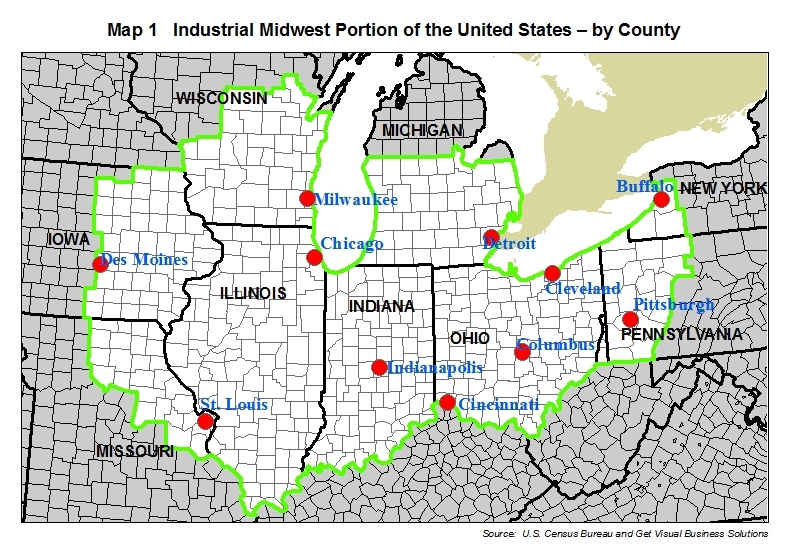 In addition, with GIS map-based databases like the U.S. Census, or the fairly common Zip Code based marketing data, one can quickly/easily define a geographic area like the industrial Midwest, tabulate the data, and illustrate it graphically. This is location analytics in practice. It makes practical use of large databases more intuitive, productive, and useful in making sound decisions. It also helps us create better tabular summaries! So here’s a tabular summary of the data, calculated using the digital county-based maps in GIS software. Since the demographic database was connected to the map, I was able to “see” my queries on the map, making error checking easy/effective. A few things jumped out at me after looking at this table. The most glaring is the fact that the industrial midwest uniformly has a significantly larger percentage of age 15 to 34 population than the United States as a whole– 40 percent versus 27 percent. Another is that this “young voter” segment of the population is WAY more significant than any of the Latino, African-American, and Asian ethnic/racial groups– in terms of percent of the total population. I also noticed that Latinos were a relatively small part of the total population in the Iowa, Ohio, and Wisconsin portions of the region, as were Asians. The African-Americans as a proportion of the total population is about the same for the industrial midwest region as for the United States as a whole, but several of the industrial midwest states have higher proportions than 13 percent. This sheds some light on the fact that African-Americans are an important factor in elections in this part of the country–especially considering that many of them live in urban areas. From the facts set forth here, I have no doubt that the young vote–people under 34–was the key factor in winning the election for Obama in this important region of the country, and in the key swing states of Iowa, Ohio, and Wisconsin. This was undoubtedly combined with significant proportions of Latino and African-American population voting for the President, particularly in the large urban areas of Ohio (Cincinnati, Cleveland, Columbus, Dayton, Toledo) and Wisconsin (Milwaukee and Madison). Any candidate interested in waging an effective campaign in 2016 will need to be aware of these facts, and pay attention to changing age and ethnicity demographics elsewhere in the United States as well.